With a name like "Tombstones In Their Eyes", i would expect a kind of dark, western goth. Something like Myssouri, but with even more of that western twang. Oh, and harmonica -- you definitely need an eerie harmonica if you are calling your band Tombstones In Their Eyes! However, if that is what you are looking for, prepare to be disappointed. It's a just a name folks. 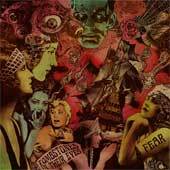 And Tombstones in Their Eyes is a psych rock band from LA. Think distorted guitars, long grinding songs, vocals lost in the mix. It is a pretty standard recipe, but i like what they are doing here on their third release. There is about 22 minutes worth of music, so it's not too long. The record starts out with guitars grinding slowly, distorted and echoed, the sound reverbing. A voice joins in, singing languidly, eventually repeating "I Want To Fly" (the title of this track) over and over as the guitarists stomp on pedals and make a good old-fashioned Spaceman3 kind of freakout, only a little slower, almost bluesy, but definitely a noise fest of epic proportions. On Separate the voice is distant and echoed, like they threw the singer in a well and just recorded his voice that way as the rest of the band thrashes around with their instruments. This has a nice droning rhythm with lots of tremolo on the guitar, and the echoed voice makes it all seem surreal in that trippy psychedelic rock kind of way. It grinds along nicely. They slow it down a little for Always There, the guitars strumming languidly while the drummer taps sparse beats. The voice is clearer though, really up front and close. On the chorus the guitars swell up and the whole thing becomes quite lovely. One guitar strums and another soars with heavy distortion in Another Day, and on the choruses it gets anthemic with the guitars throwing giant riffs as the band aaahhs in the background. Really lovely. Part of this song reminds me of The Verve in that it is a distorted pop tune, but it is also a little bluesy, like some Verve / Rolling Stones hybrid. A really great tune. The closer and EP title track grinds, the guitars reverbing in an almost sludgecore / stoner metal style. The whole thing moves under a thudding rhythm, just slowly dragging along. It is not their most engaging track, but it is a decent doom metal song i suppose. But the whole EP is pretty engaging. If you like distorted guitar rock then this is a fine purchase.